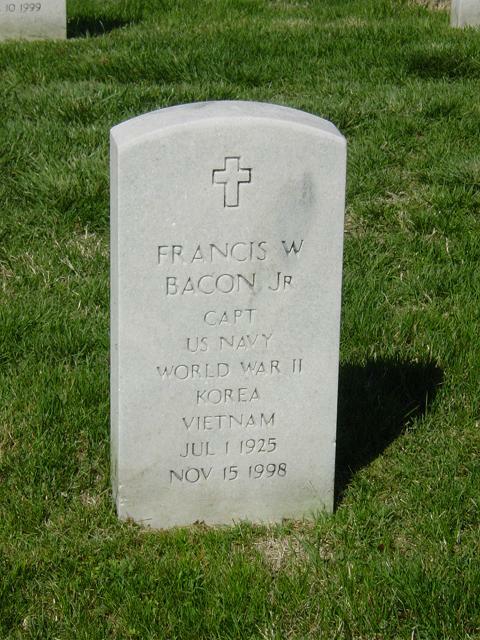 Captain Francis William Bacon Jr., U.S. Navy Retired, 73, of Lakewood, died on Sunday, November 15, 1998, in DePaul Medical Center. He was born in Marion, Ohio, and was a graduate of the U.S. Naval Academy, Class of 1948-A. In 1955, he received a master of science degree in Electronic Engineering from the Naval Post Graduate School in Monterey, Calif. He was a plank holder of the \USS Forrestal as the electronic engineering officer. He served the majority of his career managing shipyard operations for the fleet. The highlight of his 33-year naval career was his three-year tour as the commanding officer of the U.S. Naval Shipyard in Yokosuka, Japan. In addition to numerous letters of appreciation from the mayor and governor, the Emperor of Japan conferred the Third Class Order of the Sacred Treasure upon Captain Bacon. After retirement from the Navy, he worked as a consulting engineer and instructor abroad in Belgium and Iran as well as throughout the United States. Captain Bacon was past president of the Norfolk-Virginia Beach Executives Club. He also served his community with memberships in the Lakewood Civic League, the Norfolk Kiwanis Club, and the Knights of Columbus in Sturgeon Bay, Wis. He was a member of the Norfolk Yacht and Country Club and the Army-Navy Country Club of Arlington, Va. Among his many interests, Captain Bacon enjoyed sailing his ketch, the Takarabune. Survivors include his beloved wife of 50 years, Kathryn A. ''Kitty'' Bacon; four children, Deirdre Bacon Ruckman and Sheila Marie Bacon of Dallas, Texas, Francis W. Bacon III of Fredericksburg, Va., and Barbara Bacon Mitchell of Cudjoe Key, Fla.; two sister, Betty Bacon Fletcher of Port Clinton, Ohio, and Nancy Bacon Hountz of Atlanta, Ga.; three grandsons, Jessin D. Bacon and Andrew W. Bacon of Fredericksburg, Va., and Thomas F. Ruckman of Dallas, Texas. He will be sorely missed by all who knew him. A funeral Mass will be at 1:30 p.m. Thursday in Our Lady of Victory Chapel, Norfolk Naval Base. Captain Bacon will be laid to rest with full military honors in Arlington National Cemetery on Wednesday, Nov. 25, at 8:45 a.m. in the Fort Myer Chapel of the cemetery. The family will receive friends at Cox Funeral Home on Wednesday from 7 to 8 p.m. The family requests that in lieu of flowers, memorial donations me made to the International Myeloma Foundation, 2129 Stanley Hills Drive, Los Angeles, Calif. 90046.